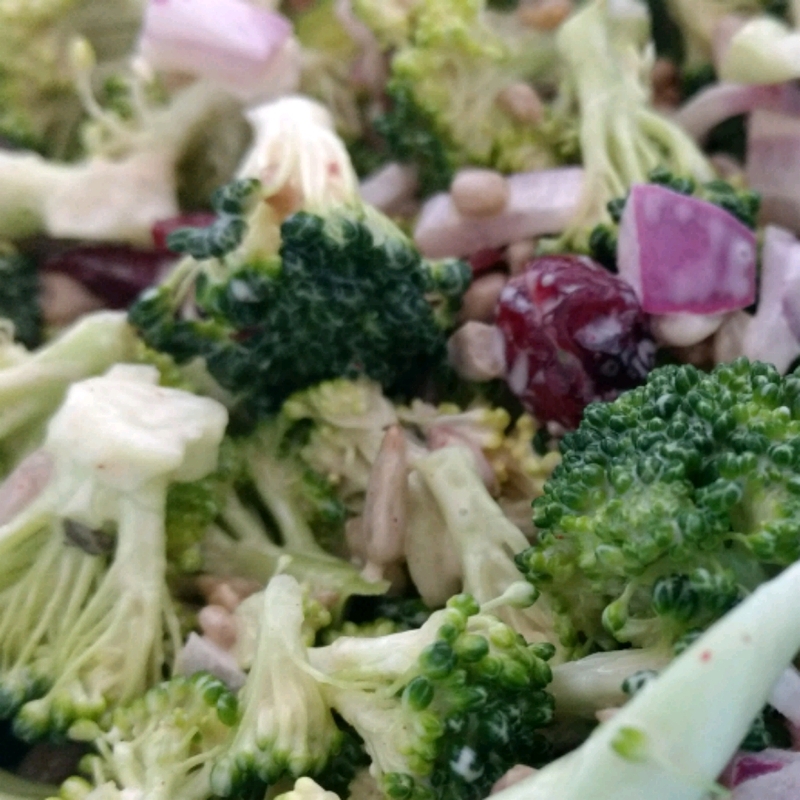 Confirmed broccoli haters have changed their minds after tasting this salad. 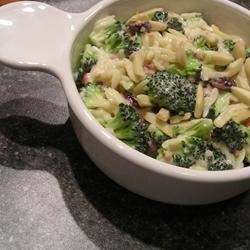 It is great for potlucks or buffet meals. Make a day or so before you wish to serve to meld the ingredients. 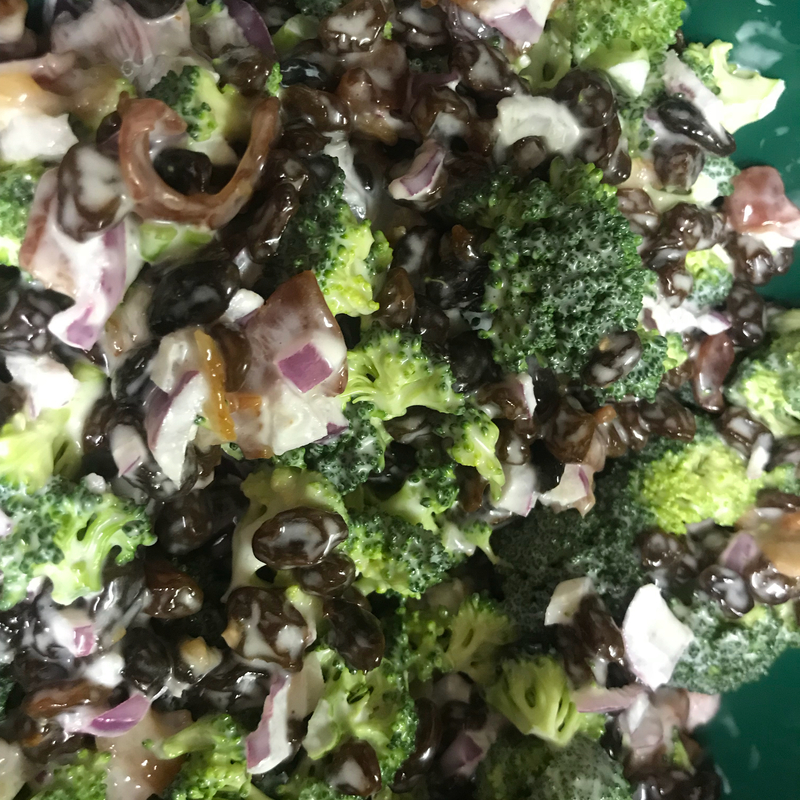 I have used sugar substitutes for the white sugar and also used nonfat or low-fat mayonnaise and it still tastes great! 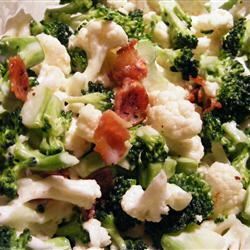 Place bacon in a large, deep skillet. Cook over medium high heat until evenly brown. Drain, crumble and set aside. 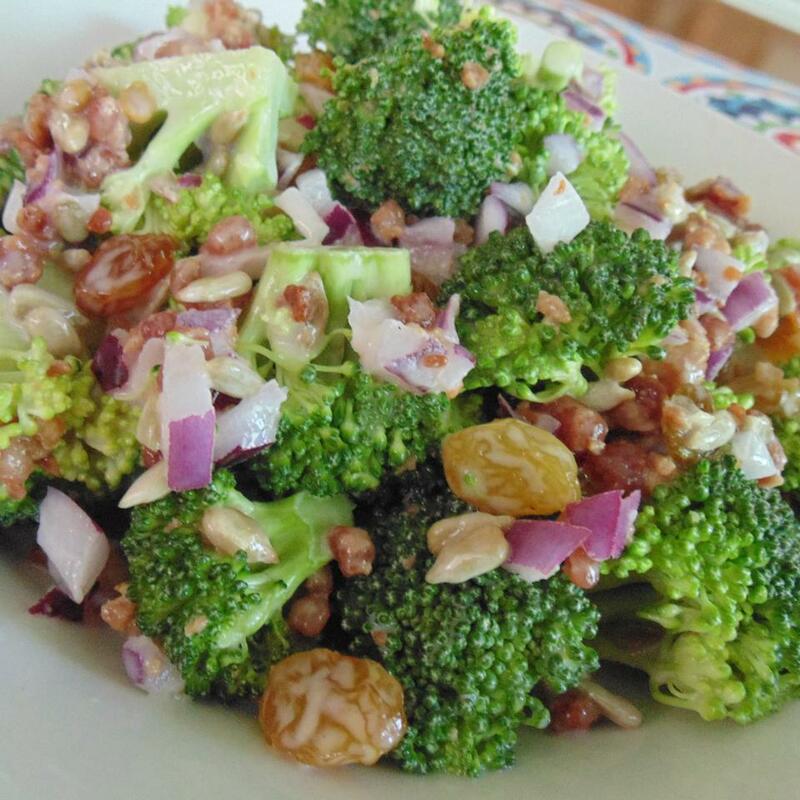 In a medium bowl, combine the broccoli, onion and raisins. In a small bowl, whisk together the vinegar, sugar and mayonnaise. 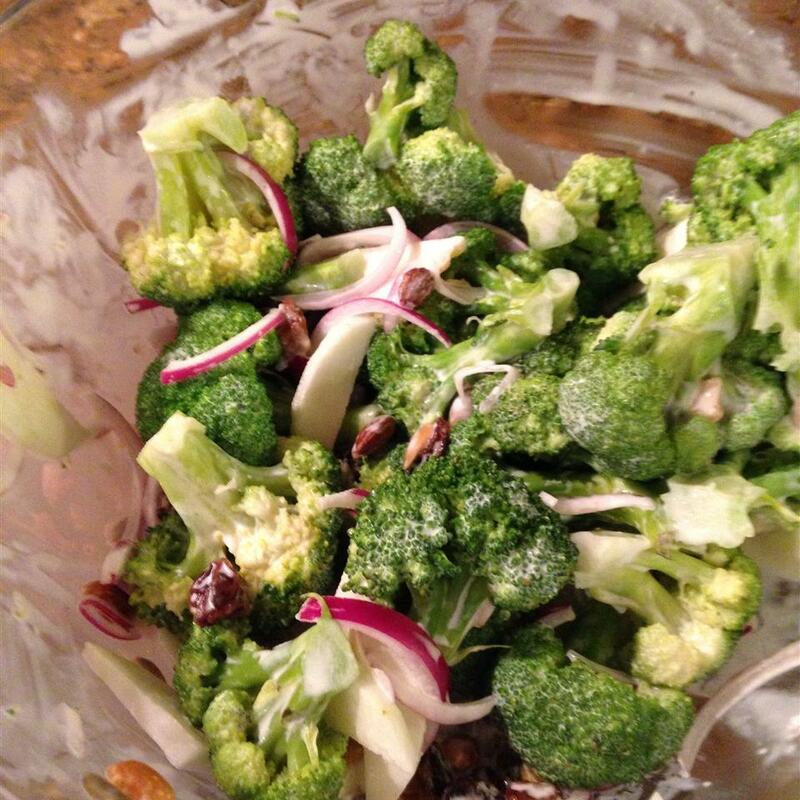 Pour over broccoli mixture, and toss until well mixed. Refrigerate for at least two hours. 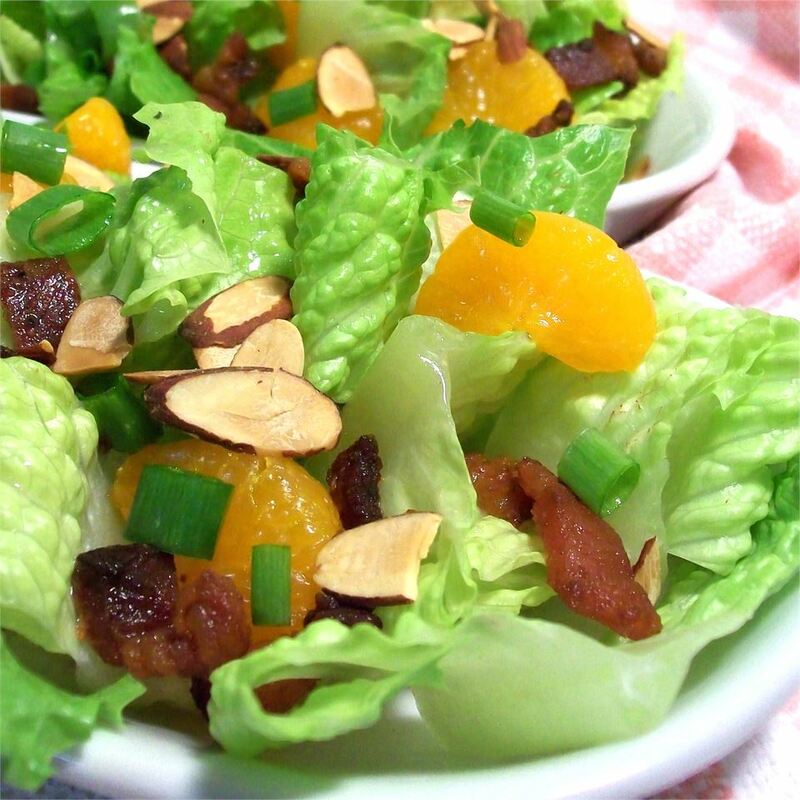 Before serving, toss salad with crumbled bacon and sunflower seeds. 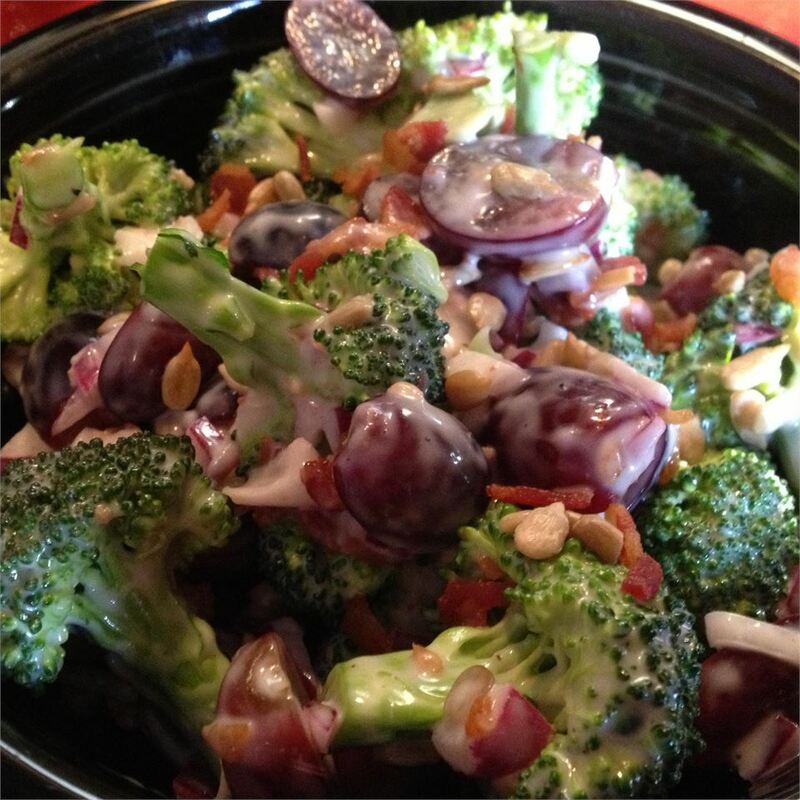 Listen to the grapes--it is a "HOLY COW Batman" of a recipe! I finally struck gold today. Took this to a church lunch and it was gone in no time. As the last spoonful was being ladled on her plate the person looked up and said "I hope you were not planning to take any of this home!" I did make a change based on readers&apos; comments GRAPES!!! Grapes man grapes! It is the deal cincher and it is fabulous. 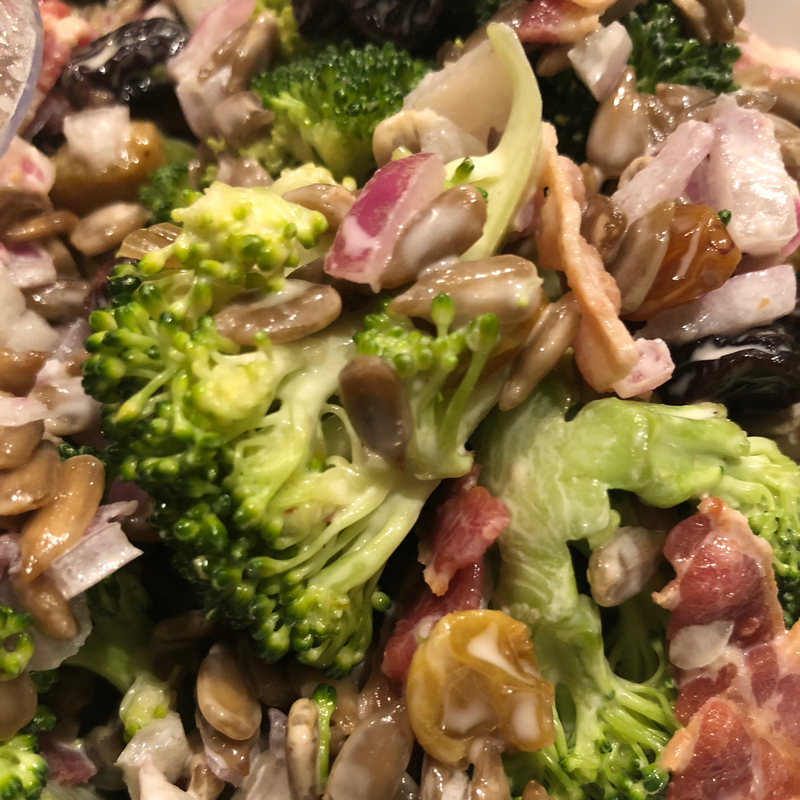 Must have red onion and the sunflower seeds could be any nut made the dressing just as it was written. BUT it&apos;s the GRAPES! Did I say Grapes? Yes GRAPES! Will be making this a lot! 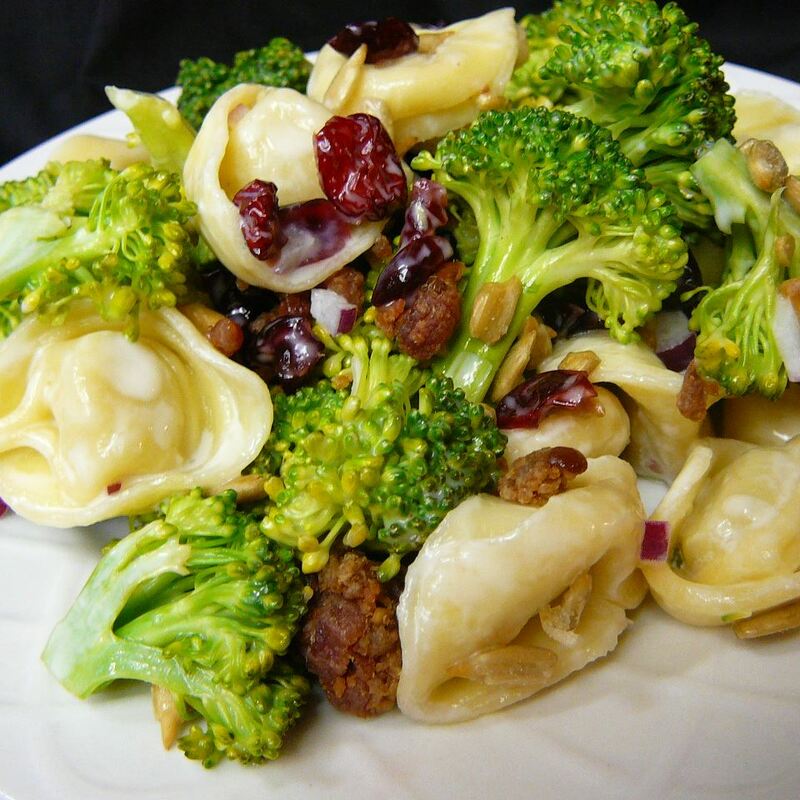 What defines taste for this recipe? What can you substitute for what? 1. Keep red onion. Do not substitute it. 2. Keep bacon. You can use more bacon then requested still be fine. 3. Raisins. I like Jumbo White raisins. Please do not use those little brown once. You need sweet-sour taste. So as previous reviewers said: you can use red grapes halved; you can use craizins. Sweet-n-Sour! 4. Sunflower seeds or roasted almonds - doesn&apos;t matter. 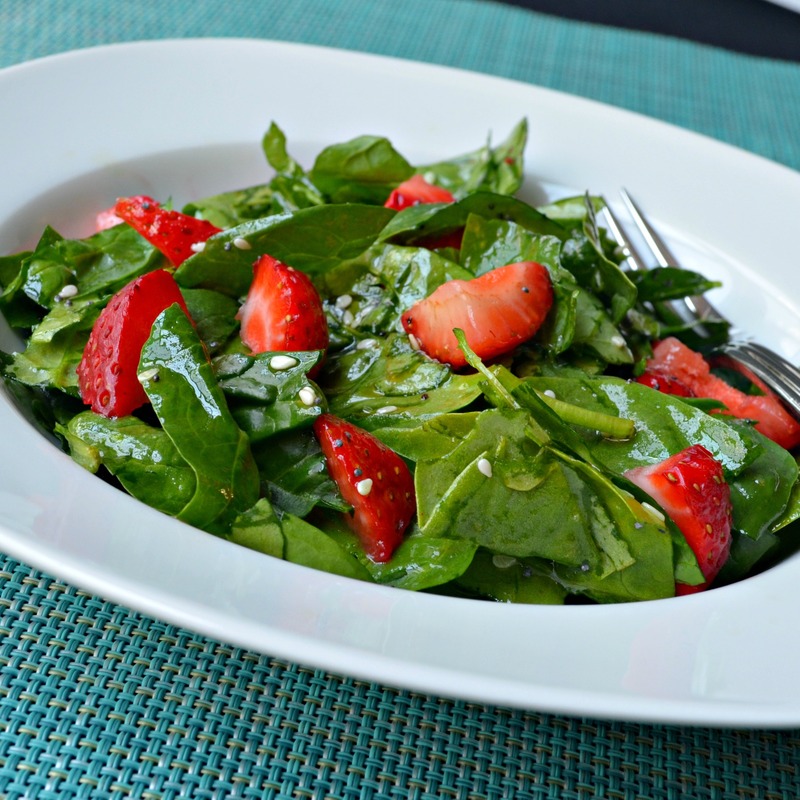 They both taste good in this salad. Add them before serving so they retain cranchinnes. 5. And dressing. 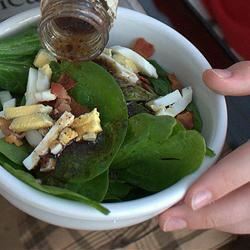 For dressing you can substitute Real Mayo for Light or for extra Light or for Sour Cream Mustard LemonJuice Salt. Really does not make any difference. You can substitute sugar for Splenda. You can use Red Wine Vinegar. The taste should be sweet-salty and a little sour. What important is the amount. If you use too little - it&apos;ll be too dry. If you use to much - it&apos;ll be soup. Add the dressing gradually. Remember that after a night in refrigirator it is going to absorb some fluid. Now - if you do substitutions for Mayo make sure this thing has salt in it because if not and you use raisins... they will become grapes again:-) and sometime quite huge grapes. I have been making this for years using slightly different amounts of the ingredients. 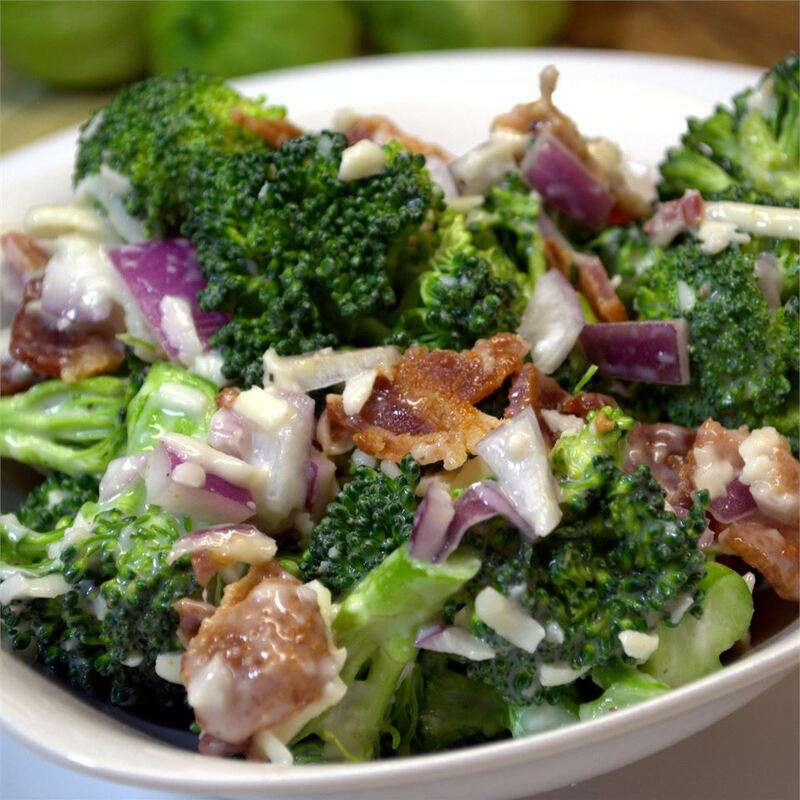 (4 cups broccoli 1 cup raisins 1 cup sunflower seeds 1/2 cup sweet red onion & 8 slices bacon for the salad. 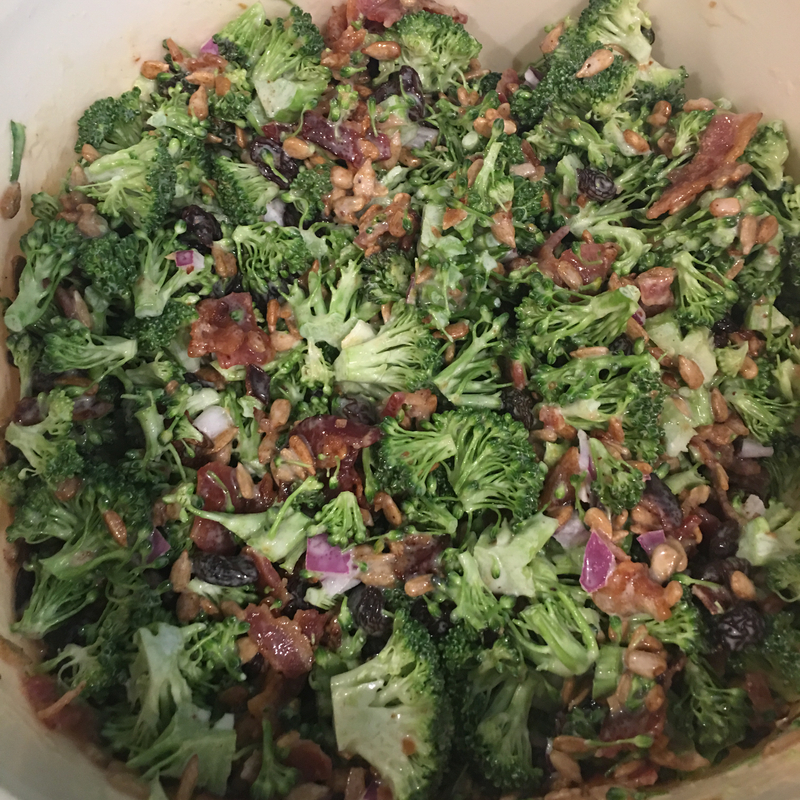 For the dressing: 1 cup mayo 1/2 cup sugar 1 T. vinegar) My suggestion to those who say the broccoli is too "crunchy": I always mix up all of the salad ingredients the night before I serve this. 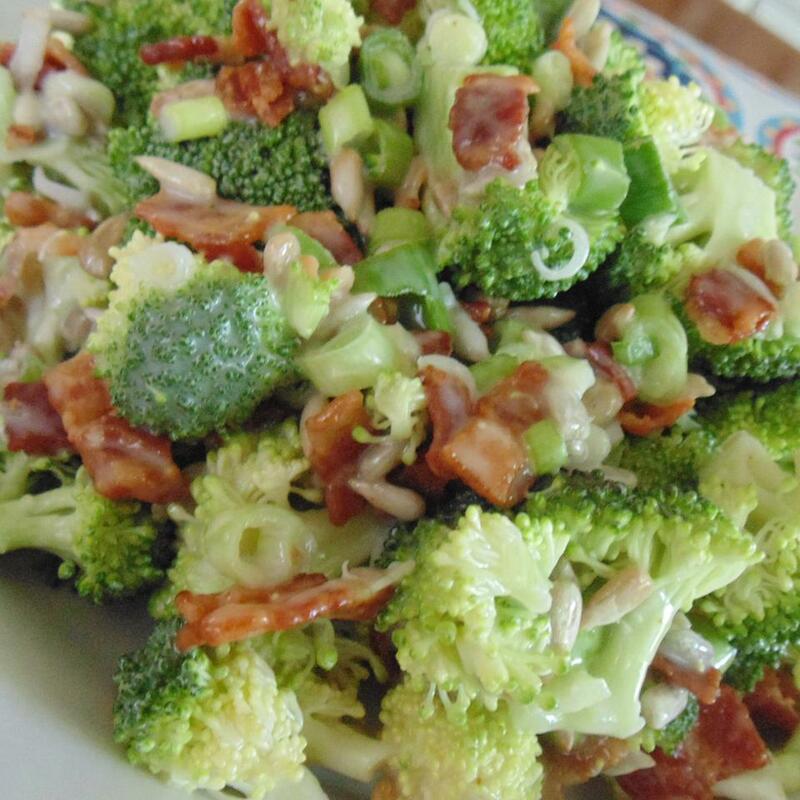 The bacon "softens" the broccoli. 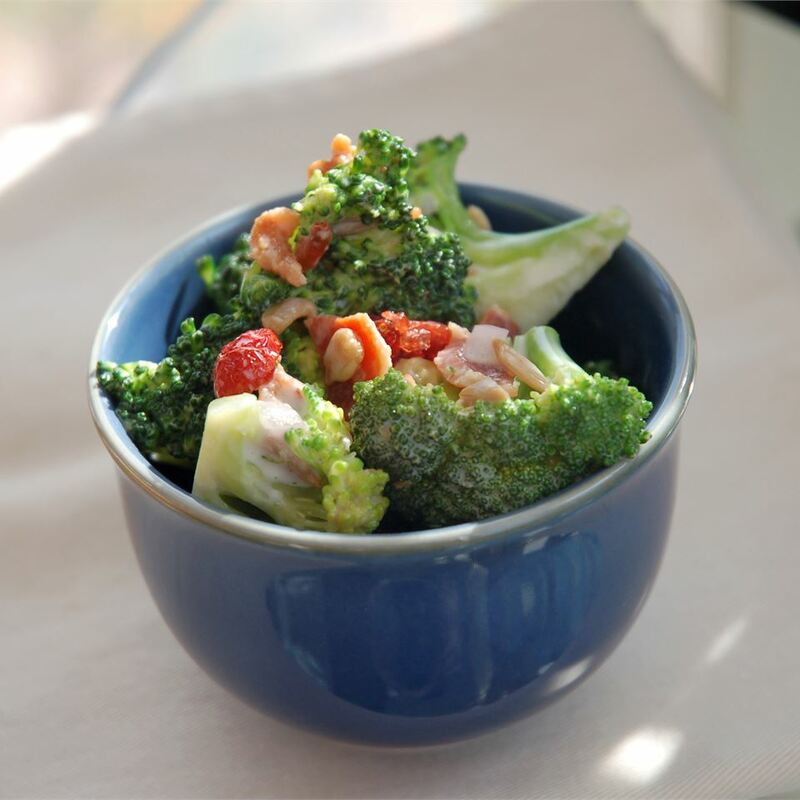 I mix up the dressing ingredients separately in another bowl and add a couple of hours before serving to let the flavors blend. And I suggest using "real bacon" but I know we&apos;re all busy people. 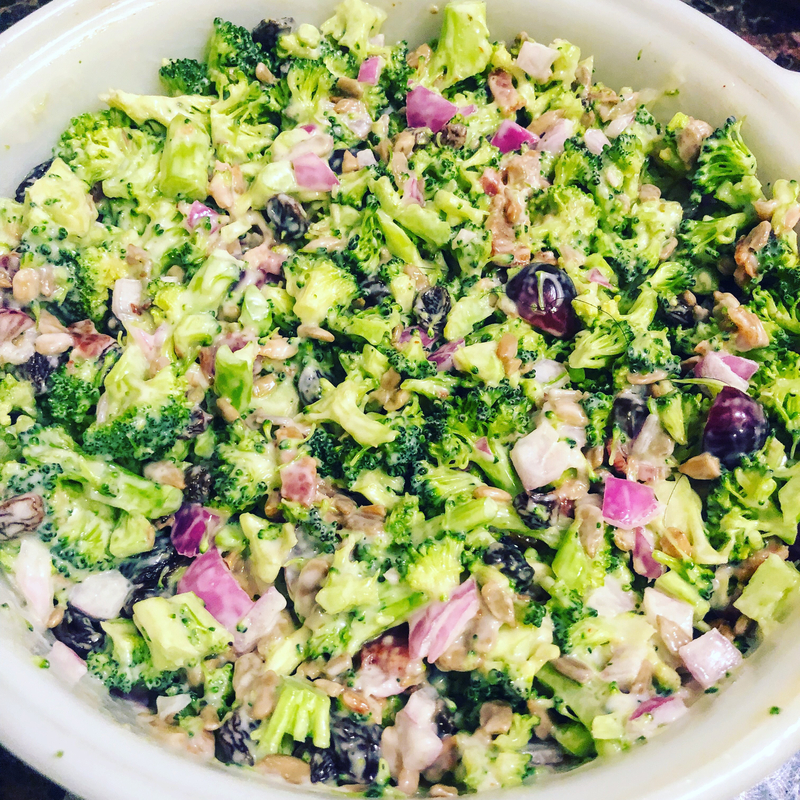 Always delicious...have had so many requests for this salad people pay me to make it for graduations weddings etc. 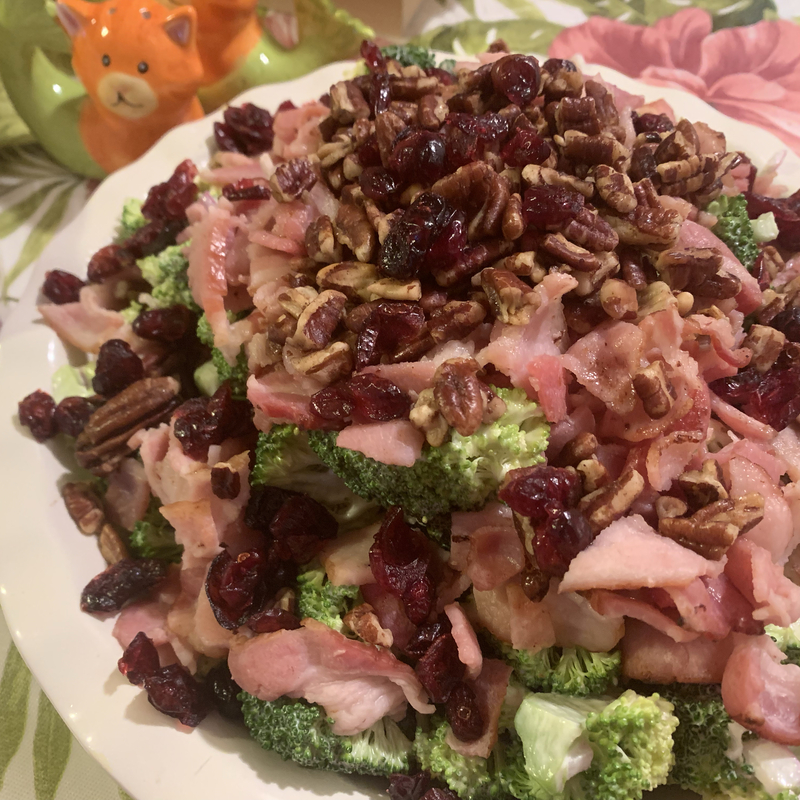 This is a good recipe but I don&apos;t think everyone made it right. 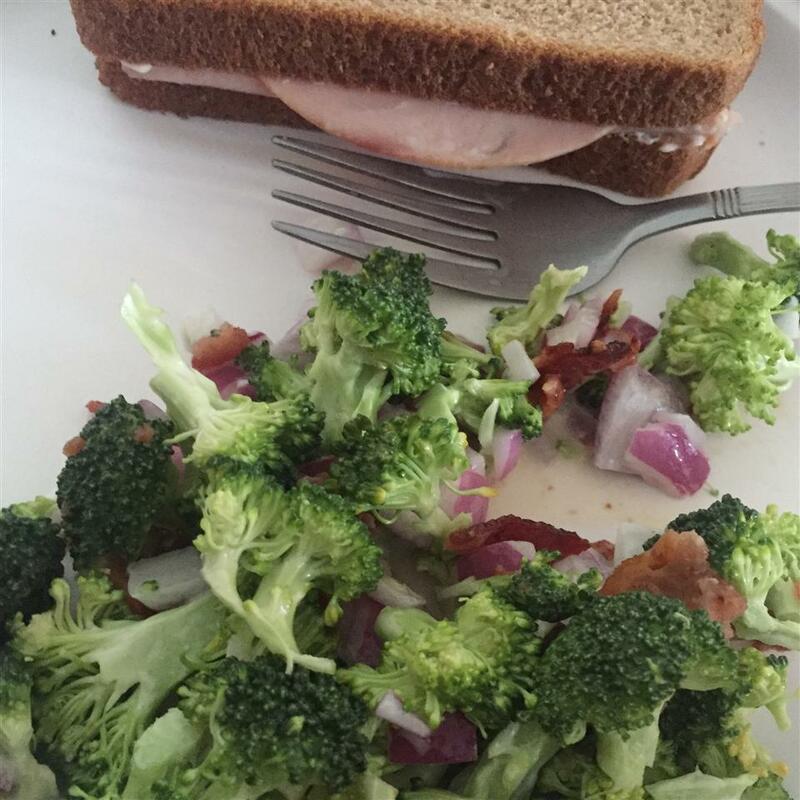 A few reviewers mentioned the bacon and the sunflower seeds getting soft. The recipe states to put them in right before serving. 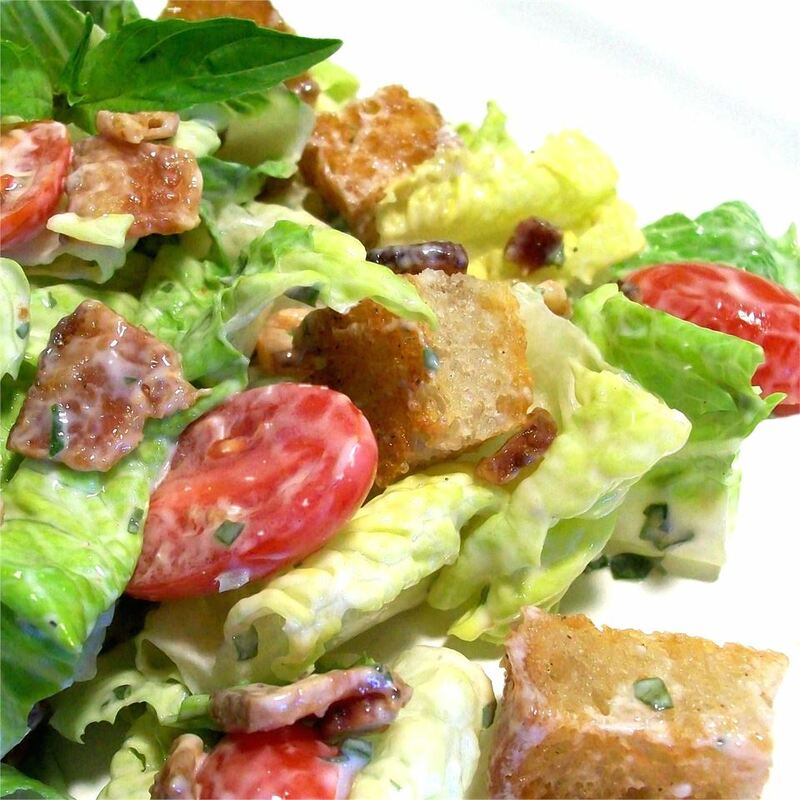 This leaves them nice and crunchy and gives the salad a nice balance. You have to use red grapes instead of raisins. 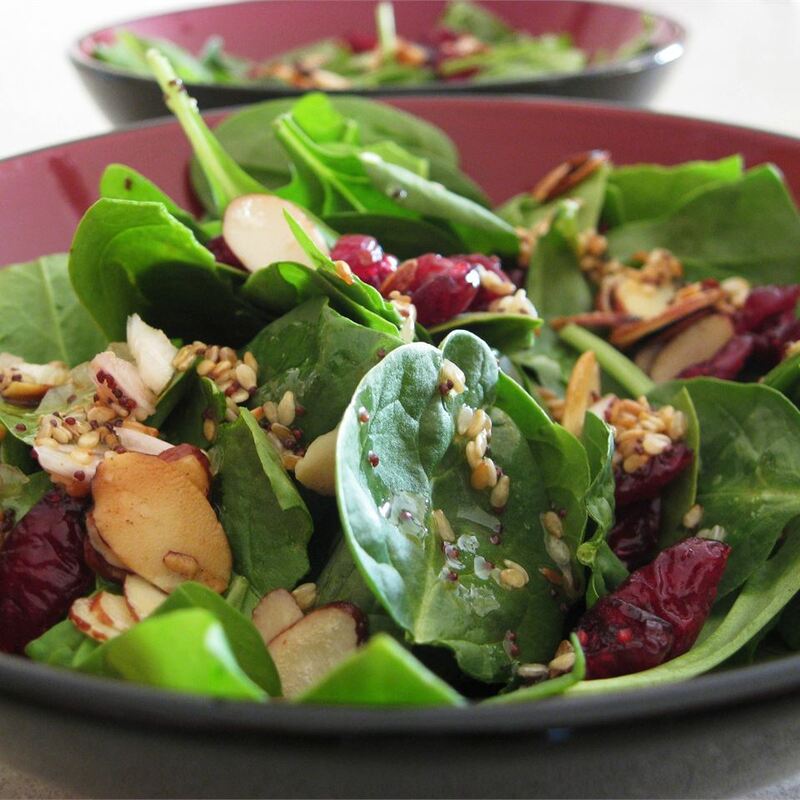 Cut the grapes in half and add to the salad. 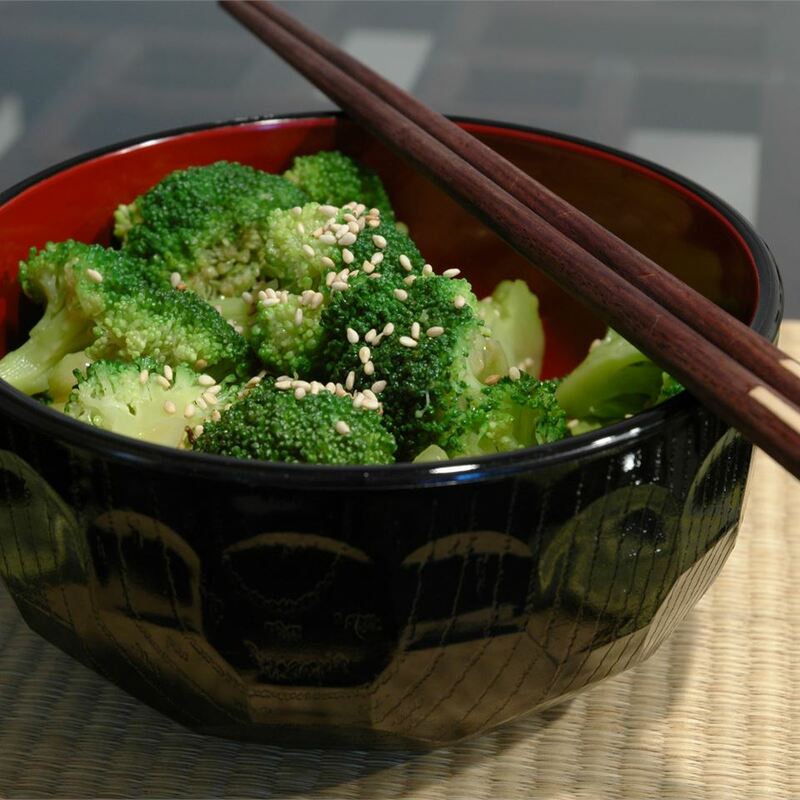 My mom has been serving this recipe in her tea house for years and always get tons of requests for it. Everywhere I bring it to I have to hand out the recipe. Please use fresh grapes though it makes all the difference in the world. This is good. I have taken this recipe to many functions. Everyone loves it! 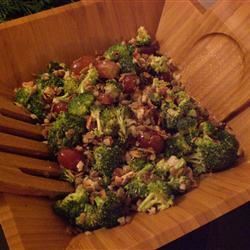 For variety I eliminate the raisins and sunflower seeds and use red seedless grapes halved and toasted almond slivers. 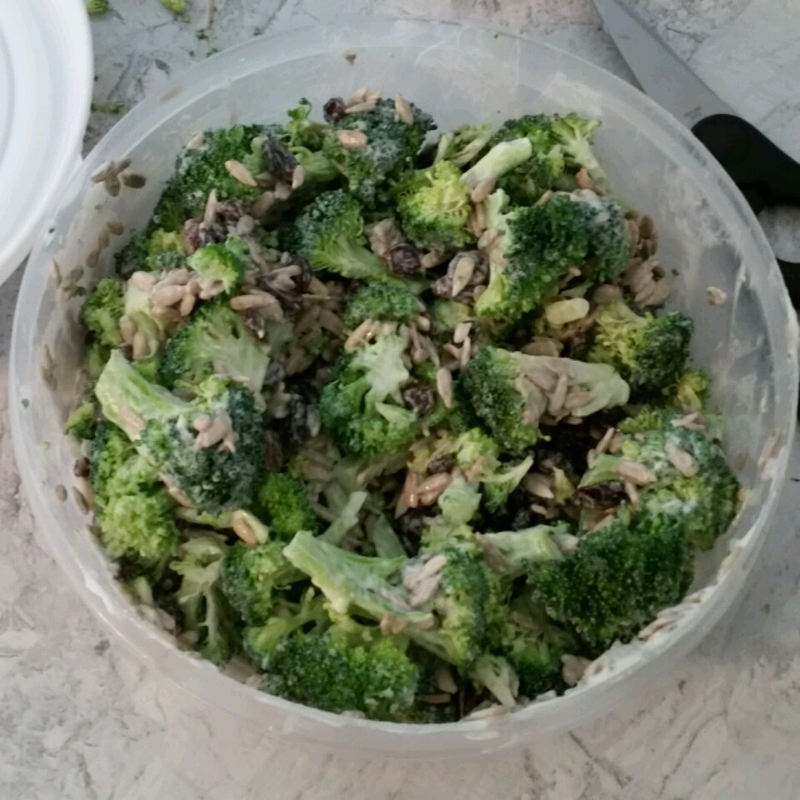 Yummy!I get lots of requests for the recipe even from my husbands fishing buddies! 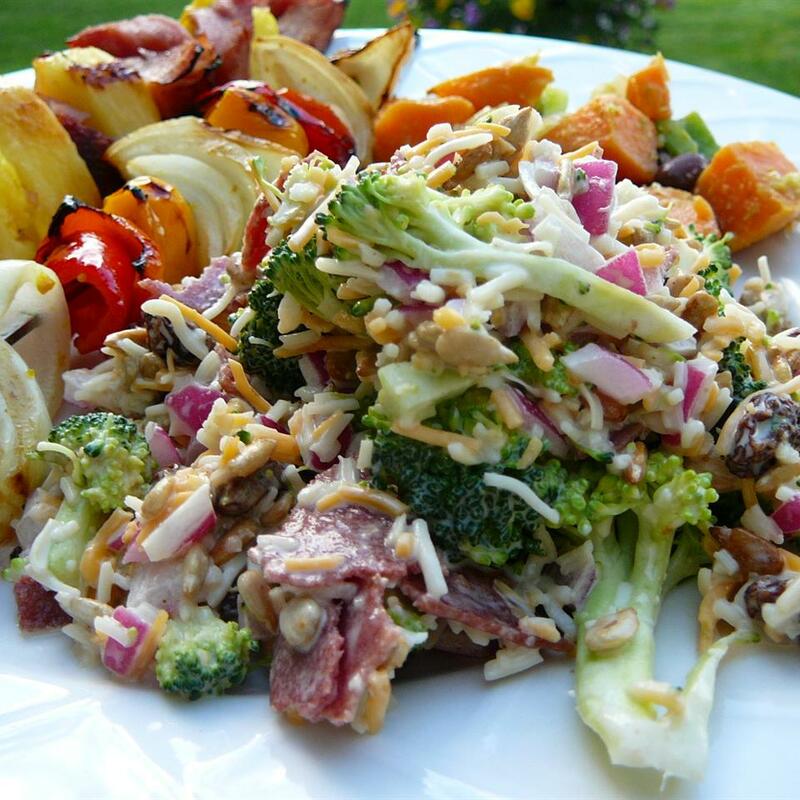 This has been one of my favorite salads for a couple of years. 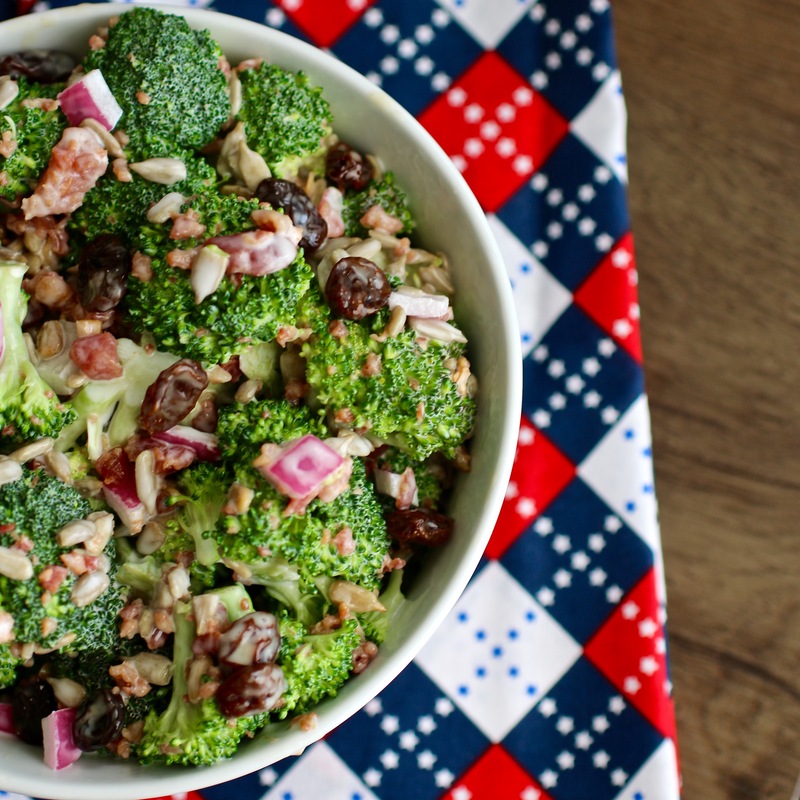 I&apos;m not a raisin fan but in this salad with the blend of the onion the bacon and the sweet-sour dressing the taste is wonderful. 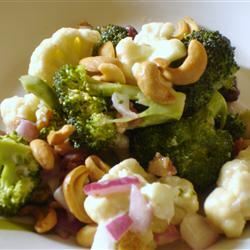 The only thing I do differently is use pine nuts. 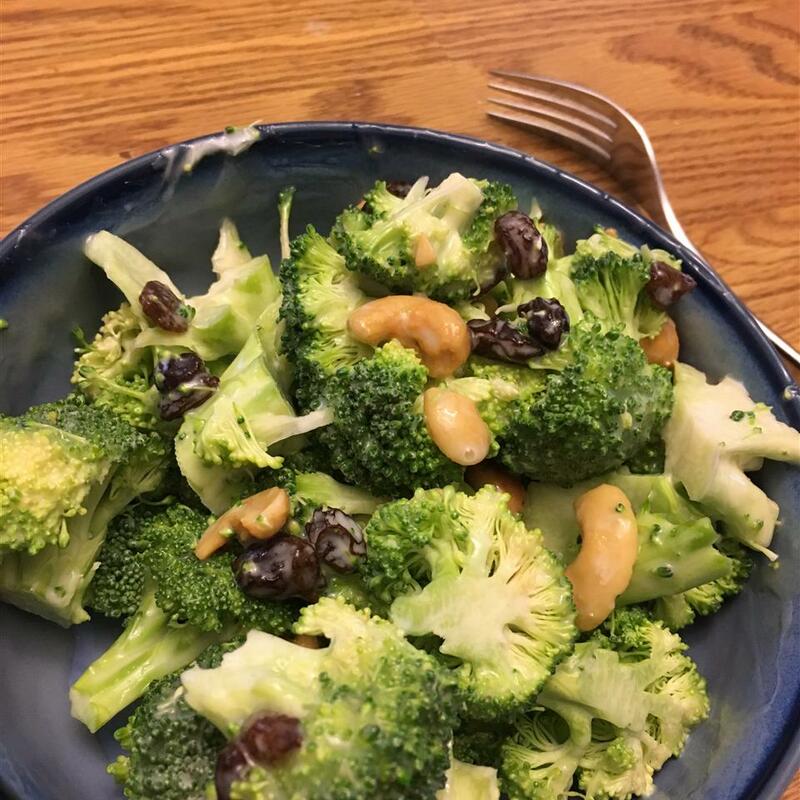 I prefer the flavor of pine nuts and they are larger and don&apos;t seem to stick to the bowl as much as the sunflower seeds do. I have even used sliced almonds as well. 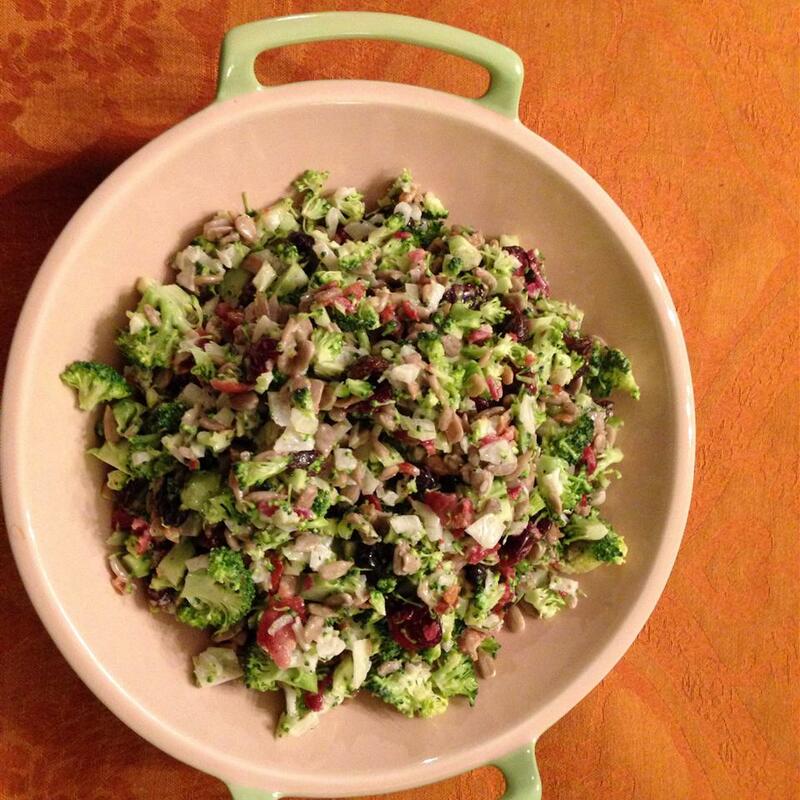 I have made this salad for years.....without the raisins and sesame seeds. It is always a hit! Another suggestion if you are trying to cut out sugar make it with "Splenda" sweetner---tastes the same without the extra carbs/sugar!!! !